The Nikon F5 was the last 35mm film based camera that NASA took into space. It made its debut in December of 1998 aboard the Shuttle Endeavour. The NASA Nikon F5, like the F4S model that preceded it, was virtually identical to the commercial version available to the public, save for the replacement and reformulation of internal lubricants that would be able to meet NASA's stringent requirements. Nikon's long history with developing equipment for NASA had resulted in many technological mprovements that Nikon incorporated into their professional camera line, so unlike the F3 and the F models, cameras no longer need a myriad of modifications made, which kept costs down for both NASA and Nikon. The F5's fast and accurate autofocus were highly praised along with the extremely accurate matrix metering for determining exposure. Both resulted in significantly more usable images, and the automation resulted in shorter training cycles to get astronauts up to speed. 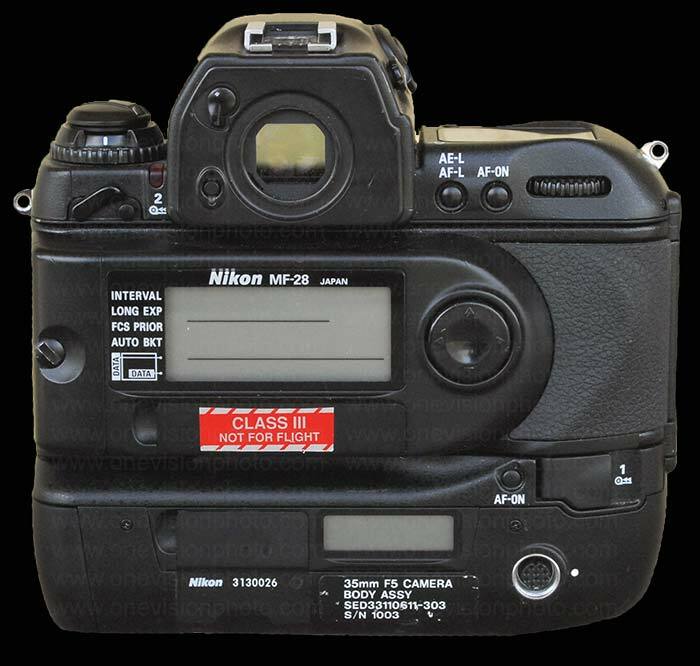 The NASA Nikon F5 models were all equipped with a Nikon MF-28 data back. This multi function back enabled the astronauts to record key data (related to the image they were photographing) directly on to the film. The data was usually printed between the frames and varied depending on the subject matter. 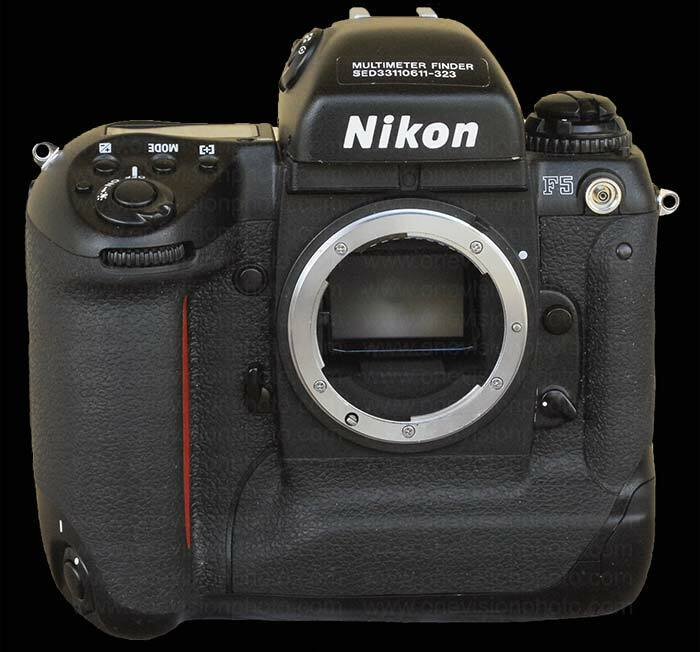 The NASA Nikon F5 was a full featured camera that was extremely capable. As such, there were many shooting modes and situations that were at the astronauts disposal. Needless to say, even for a professional photographer, it is difficult to be fully fluent on everything a complex camera like the F5 can do - let alone everything else that a Mission specialist must know whilst in space. It is for this reason that NASA had adopted the use of 'cue cards' to provide the astronauts quick reminders about things. Cue Cards in the past had often taken the form of short instructional decals that were affixed to the cameras, light meters, film backs and other apparatus. As technology became more capable and complex, and the astronauts became more savvy, the 'cues' they needed were more comprehensive - much more so that what would fit on a decal. Cue cards then evolved into physical cards which could then be sorted through to find the specific need, then have them at hand when the need arose. 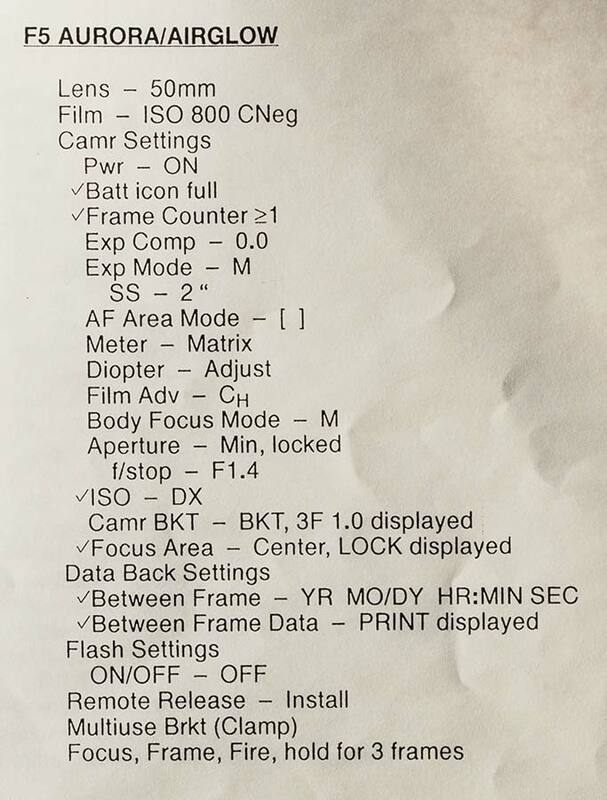 A NASA Nikon F5 'cue card' for camera, MF-28 databack and flash settings when taking photographs of the Aurora Borealis or Aurora Australis from a spacecraft. Taken from my own personal collection. The F5 EVA model made its debut aboard the Shuttle Discovery in December of 1999 on STS-103, making it the first auto focus 35mm camera used for spacewalks. 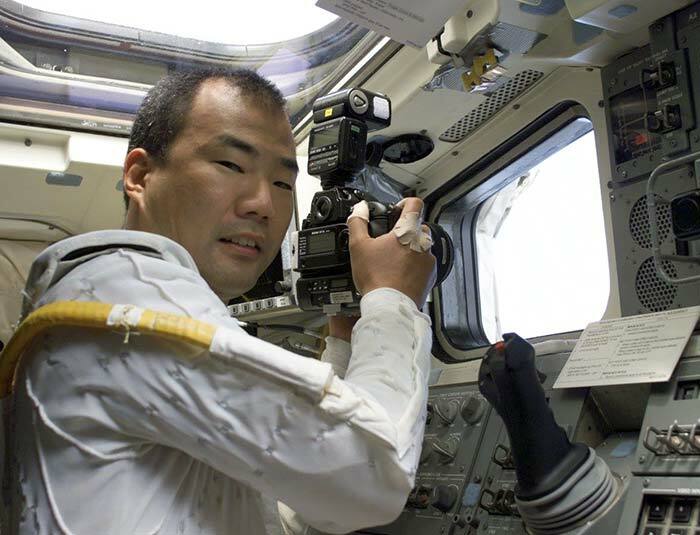 Previously, the NASA Nikon F3 Small Camera was used for EVA recording, however the lenses required manual focusing by the astronaut. As such, many images captured were blurry, since the ability to verify focus using the viewfinder through the facemask of a space suit, was next to impossible. With the F3, exposure was also preset for EVA, which often resulted in incorrect exposures, given the immense dynamic range in space and that regardless of the composition, the same exposures would be used. Although the older NASA Nikon F4S had auto focus capabilities, none of this model were cleared for use outside of the space vehicle, instead they performed the duty of capturing on board activities (IVA). 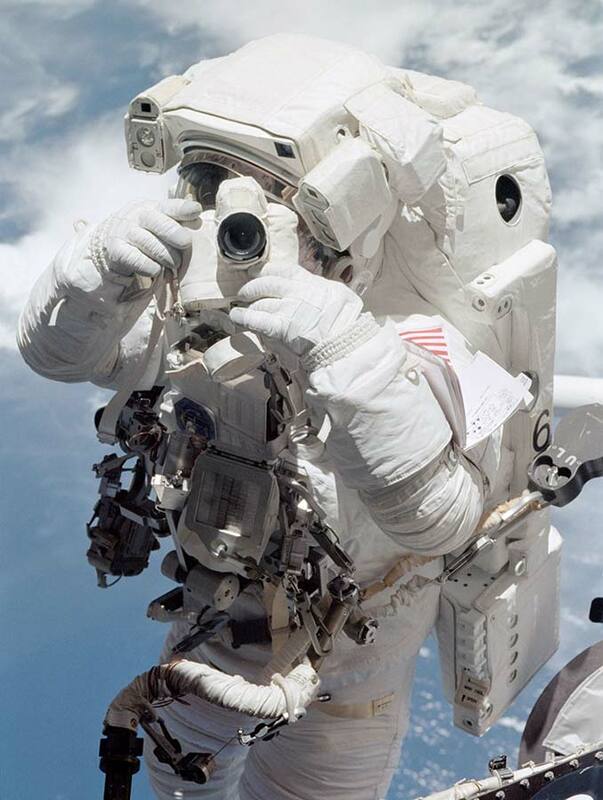 It was not until the F5 that NASA approved a new camera for use during EVA. Being subject to the extremes of space, the F5 EVA versions had to have specific non-migrating lubricants and adhesives needed to be able to withstand temperatures ranges of -50 degrees celsius upward to 110 degrees while also being able to operate in a dry vacuum. Auto focus lenses developed for EVA use were also prepared in three different focal lengths (28mm F2.8D, 35mm F2D and 50mm F1.4D) using the same lubricant formulation. Nikon wound up delivering 35 F5 camera bodies, 8-28mm lenses and 12 each of the 35mm and 50mm lenses to fill NASA's demand.. Since the NASA Nikon F5 EVA camera woudl need to autofocus the lens while outside the spacecraft, like the F3 Small Camera, a custom thermal blanket was developed for the F5 to further insulate it. The F5 thermal blanket was, in essence, a 'coat' for the camera. 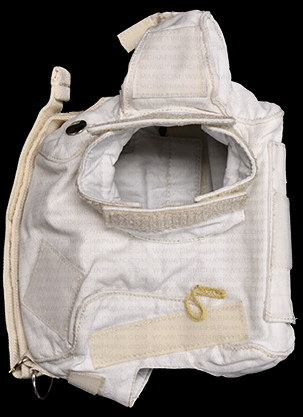 The blanket involved a construction similar to the spacesuits: 12 layers of aluminized mylar film with a shell of Ortho fabric on the outside and Teflon fabric on the inside. Unlike the F3's thermal blanket, the F5 blanket surrounded the sides of the lens as well as the top and sides of the viewfinder. A flap could be easily opened and closed over the lens. 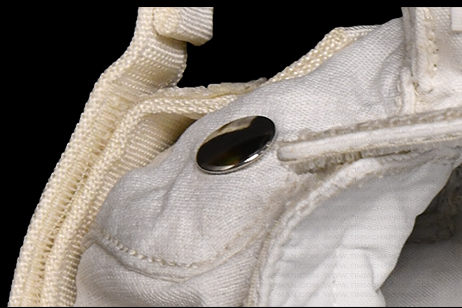 The F5 camera prevented the astronaut from taking a photo if the lens wasn't able to lock the focus, so with the flap covering the lens, images could not be accidentally taken, like frequently was the case with the F3 if the camera was bumped. To further insulate the camera from the elements, instead of having a protruding, raised shutter release button (which the F3 used), engineers affixed a metal 'button' into the F5 thermal blanket which was positioned directly over the shutter release. The astronaut needed to simply press the button through the blanket and the pressure would transfer through to take the picture, all while keeping the camera cozy and (relatively) warm. A '1 hour flaps down' rule was implemented ny NASA which meant that astronauts should avoid not to expose the lens to the outside for longer than an hour at a time. This helped assure that the unit would not get too cold where it couldn't operate. The F5 would also serve as the base camera for Kodak's DCS 660 and 760 digital cameras, so NASA could again benefit from not having to retrain the astronauts in the basic camera operation, once the digital versions began to fly. Sadly, by the middle of 2002, the era for film cameras in space had to draw to a close. Digital technology finally reached the level of comparable resolution and acceptable resolving power that the benefits of digital imagery far outweighed that of film. At this point , most missions were destined for the International Space Station where expeditions lasted months instead of days. Given that film stored in space for a long period of time could fog from radiation exposure, it became clear that it was time to retire the F5 and close the 35mm film chapter in space. Posted in nasa nikon space cameras and tagged nasa nikon, nasa, nikon, space camera, f5, film camera, nasa modified, iva, eva.